What on earth are you wearing, child? I've never seen such a thing on a kitten before. Wait a minute, is that a DOG vest? That's quite a fashion risk you're taking. Please don't let her get to you, Wylla. You are a kitten style icon. Don't let anyone tell you otherwise. 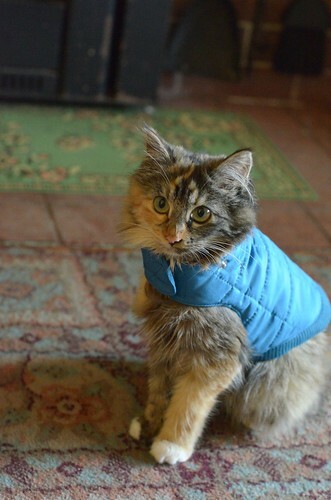 Wylla is setting the bar high for fashionable kittens everywhere--no matter what Bean says! Oh, Bean -- Wylla's setting a trend with intra-species fashion!! It's all the rage this season on the catwalks! Don't worry Wylla. 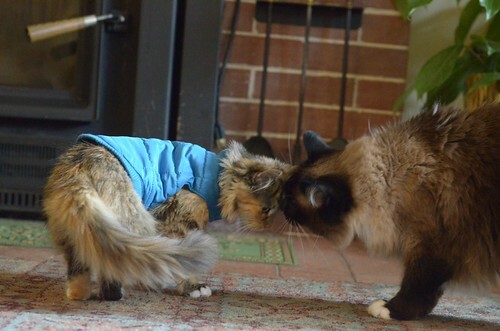 Bean will be so jealous when it cold and blustery out and you have your warm vest and she only has her furs to keep her warm. Cute as a barrel of buttons! We knew another cat who wore doggy fashions quite regularly. His name was Skeezix and he was quite well known. Now he wears doggy fashions over the bridge. We think you look marvelous!!!! I had to giggle at the idea of Wylla getting tattoos! Thank you! Wylla you look great !! 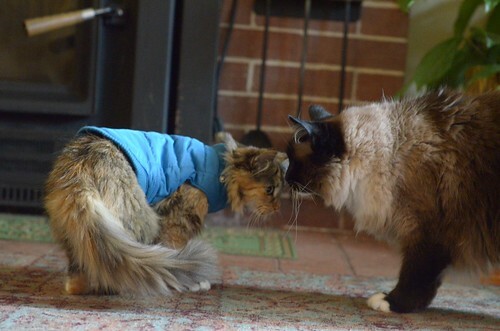 -- Ms. Bean is just jealous because she can't fit into your lovely blue kitten vest. Wear your new vest with dignified pride. These are for hairless cats, but might fit Wylla. Made of fleece and they look very comfy. Perhaps some itty bitty envy, but not to worry, Charlene, you will always be the fairest of them all. She looks so comfy and at ease! This was such a good idea. We can't have chilly kittens. Charlene is naturally floofy and beautiful! 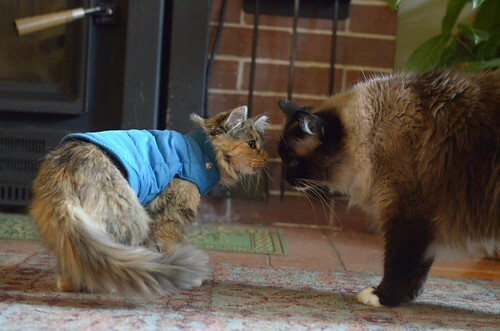 But it is not the size of the dog wearing the vest but the style of the kitten wearing the vest. What a beautiful little fashionista you are, dear Wylla. And Charlene is ultra stylish in her lovely au naturel coat. Uh oh, looks like Bean "spilled the BEANS" about it being a dog vest! We weren't supposed to tell! I could see how this is going to start a run on the smaller sizes of dog vests.. people are going to want these for their cats now. 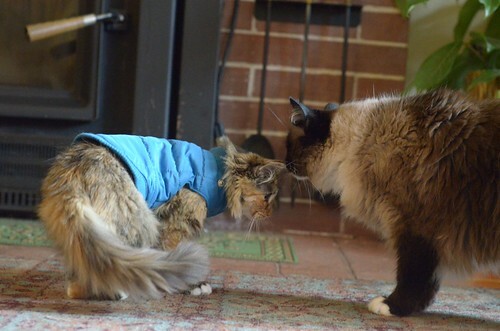 Maybe the pet supply companies should take note that cats can get cold too?